^ Bennett, Andy; Waksman, Steve (2015-01-19). The SAGE Handbook of Popular Music. SAGE. p. 458. ISBN 9781473914407. ^ Buchanan, Ian; Swiboda, Marcel (2004-01-01). Deleuze and Music. Edinburgh University Press. p. 107. ISBN 9780748618699. ^ a b c d Sil, Janet (2013). Ishmael, Amelia; Price, Zareen; Stephanou, Aspasia; Woodward, Ben, eds. "Open a Vein: Suicidal Black Metal and Enlightenment". 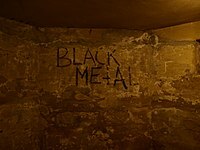 Helvete: A Journal of Black Metal Theory. Brooklyn: Punctum Books (1): 5–19. ISSN 2326-683X. ^ Davis, Erik (2007-11-13). "Deep Eco-Metal". Slate. ISSN 1091-2339. Retrieved 2016-12-21. 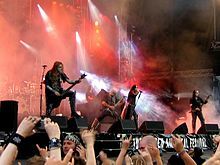 ^ "Anti-Islamic female black metal band from Iraq a hoax? | The Metalluminati". 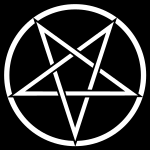 metalluminati.com. Retrieved 2017-08-04. ^ Luedtke, Christopher (February 2, 2016). "Essential Black Metal Listening: XASTHUR Nocturnal Poisoning". Metal Injection. Retrieved June 12, 2017. ^ Von Havoc, Felix (1984-01-01). "Rise of Crust". Profane Existence. Archived from the original on 2008-06-15. Retrieved 2008-06-16. ^ a b Wiederhorn, Jon (April 2009). "Stairway to Heathen". Revolver: 60–64. Archived from the original on 2009-05-12. Retrieved 2009-05-11. ^ Jonsson, Johannes (November 13, 2011). "Vardoger – Whitefrozen". 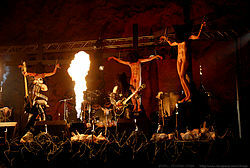 Metal For Jesus!. Johannes Jonsson. Retrieved August 5, 2015. ^ Howells, Tom. "Blackgaze: meet the bands taking black metal out of the shadows". the Guardian. Retrieved 2015-10-05. ^ Murphy, David (2012). "Chapter 25: Extreme Neo-nationalist Music Scenes at the Heart of Europe". 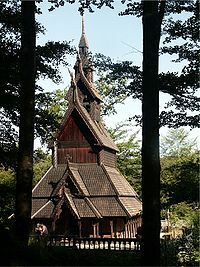 In Ullrich Kockel. A Companion to the Anthropology of Europe. Blackwell Publishing. p. 437. ^ Noys, Benjamin (2010). "'Remain True to the Earth! 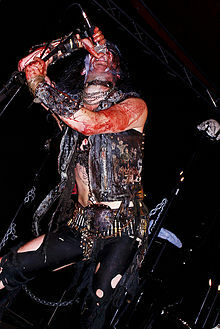 ': Remarks on the Politics of Black Metal". In Nicola Masciandaro. Hideous Gnosis: Black Metal Theory Symposium. Glossator. pp. 106–108. ^ Lesourd, Elodie (2013). "Baptism or Death: Black Metal in Contemporary Art". In Amelia Ishmael. 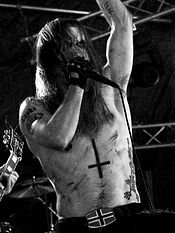 Helvete: a Journal of Black Metal Theory. Punctum Books. p. 36. ^ Trafford, Simon; Pluskowski, Aleks (2007). Marshall, David W., ed. 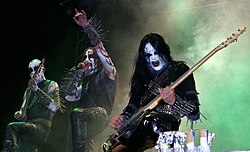 "Antichrist Superstars: The Vikings in Hard Rock and Heavy Metal". Mass Market Medieval: Essays on the Middle Ages in Popular Culture. McFarland & Company: 64. ISBN 978-0-7864-2922-6. ^ a b c d "Canadian Crust Punks Storm of Sedition Go Off the Grid on Their Furious New 'Decivilize' LP | NOISEY". NOISEY. Retrieved 2016-05-10. ^ "Skagos: Anarchic Album Review | Pitchfork". pitchfork.com. Retrieved 2016-05-10. ^ a b Berto. "Review Vidargangr - A World That has To Be Opposed". Lords of Metal. Retrieved 2016-05-10. ^ a b c d "If It Ain't Got No Blastbeat, It's Not My Revolution: Panopticon". PopMatters. Retrieved 2016-05-10. ^ "ZYX SITRUUNA 3 mg (1 × 20fol)". Nettiapteekki | Apteekkituotteet netistä (in Finnish). Retrieved 2019-03-06.